Lets take another example of little known company Mayur Uniquoters which is our 7-Bagger stock. We recommended this stock 5 years back at price of Rs. 56 (adjusted price after 2 bonus issues and stock split in last 5 years, actual recommended price was Rs. 448) and yesterday it closed at Rs. 380 giving absolute returns of 575%. You might be surprised to know that Mayur Uniquoter is a 126-Bagger stock for investors who invested in it 8 years back. Investment of Rs. 1 lakh in Mayur Uniquoters in Jan 2009 is valued at Rs. 1 Crores and 26 lakhs today. That's too excluding dividend payouts. Mind boggling, isn't it? It's a fact! Company has posted strong growth YoY and rewarded share holders in big way, Company was trading at Rs. 3 (bonus / split adjusted price) with market cap of merely 13 crores in Jan 2009, today market cap of the company is 1,730 crores. It’s a fact that 41 Hidden Gems out of 64 released by our equity analysts in last 6 years (till Dec'16) have given more than 100% returns. Moreover, 30 out of these 41 stocks have given returns in the range of 200% to 1900%. As illustrated in the table above, average returns of Hidden Gems stocks released in 2014 is 187% compared to small cap index average returns of 62.6%. 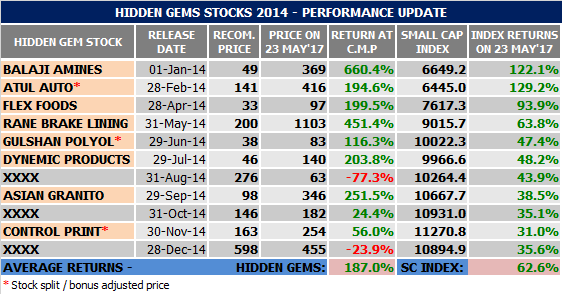 Hidden Gems stocks of 2014 are outperforming small cap index by whopping 124.4%. Total 7 stocks of 2015 have already achieved their target price. As illustrated in the table above, average returns of our Hidden Gems stocks released in 2015 is 93.3% compared to average returns of 31.3% of small cap index, out performance of 62%. 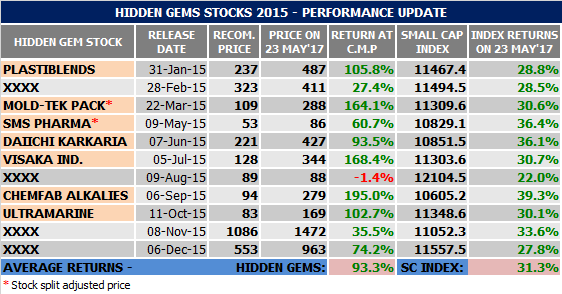 Our Hidden Gems stocks of 2016 have also outperformed small cap index. 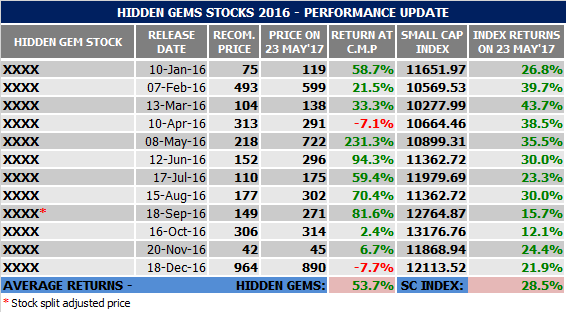 As on date, average returns of our Hidden Gems 2016 stocks is 53.7% compared to small cap index average returns of 28.5%, out performance of 25.3%.